Turnkey 'design and build' contract for an above-deck self-unloading handymax bulk vessel with two traveling chain-bucket reclaimers, deck conveyors and a 80 metre truss boom. The Unloading System can handle a large number of materials including iron ore, coal, salt, limestone, granite, etc. 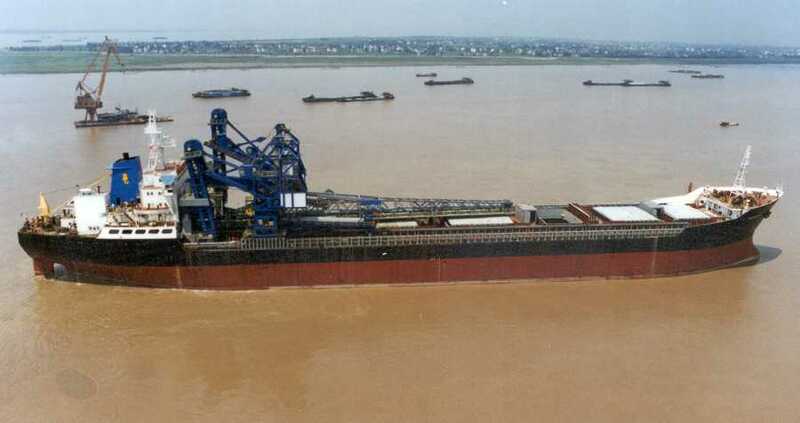 The design capacity is 3 000 tonnes per hour based on 0.8 tonnes / cubic metre of coal (max lump size 100 mm) or iron ore. The Unloading System consists of two travelling, luffing and slewing marine leg bucket elevators. One deck conveyor and an S-loop conveyor will be used to transport materials to the aft of the ship and transfer on a fixed luffing and slewing boom capable of recycling cargo into cargo holds #4 by use of fixed plows. The Unloading System is designed to operate in a trim and heel of one degree and list of two and a half degrees and maximum wind speed of 20 m/sec. In order to provide self-loading capabilities, the two travelling marine leg reclaimers are equipped with a stacking boom capable of slewing 360 degrees. This will permit barge to ship transfer of material into the cargo hold of the ship. The boom is designed to permit the attachment of an actuated trimming spoon. The starboard side marine leg boom can be used to transfer material to the port side deck conveyor. The marine leg reclaimers are designed to reclaim material up to 150 mm from the tank top. In order to assist with final clean-out of the cargo holds, two CAT 914G front-end loaders will be used.